The cast of “Amazons and Their Men” at Diversionary Theatre. Leni Riefenstahl was a complex character — a groundbreaking filmmaker who devised film techniques that are still in use today. She was a director, producer, screenwriter, editor, photographer, dancer and even actor. She also turned out to be on the wrong side of history, cozying up to the Nazis and making huge propaganda films for them, and in return, accepting funding from the government for her other, more personal projects. She is often considered to be the most outstanding female director of the 20th century. But her alliance with the Third Reich (particularly with Propaganda Minister Joseph Goebbels, and even with the Führer himself), clung to her for the rest of her very long life, though she steadfastly denied any awareness of the Holocaust to the day she died (in 2003, at age 101). 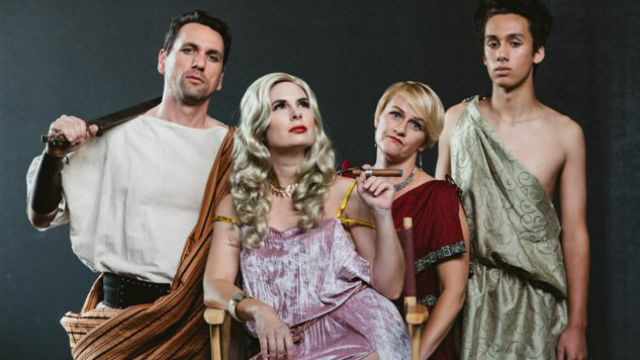 Playwright Jordan Harrison, whose satirical “Maple and Vine” was produced at Cygnet Theatre last year, took a slice out of Riefenstahl’s life to create “Amazons and their Men” in 2008. The play is currently making its West Coast debut at Diversionary Theatre, helmed by new artistic director Matt M. Morrow. The work plays fast and loose with the facts, and doesn’t even use names for the characters, who are The Frau (Riefenstahl) and her cinematic pawns: The Man, The Boy and The Extra, which is to say, the director’s sister, who serves as the conscience of the piece, and the voice of reason (for the record, Riefenstahl only had a brother, who was killed in WWII). The Frau (Kerry McCue) is hellbent on making a picture about the Amazon Queen Penthesilea and her attraction/combat with the great Greek warrior, Achilles (Riefenstahl did attempt to make such a film, but it never came to fruition). Naturally, she cast herself in the leading role. The play toggles back and forth between the art/artifice of the film shoot and the offstage reality, backgrounded by the horrors happening outside, to which The Frau repeatedly turns a deaf ear — even when telegrams from the Minister of Propaganda warn her that war is imminent. She promises to protect the vulnerable men in her cast — one Jewish, one Roma/Gypsy — but when the two fall in love (paralleling their onscreen relationship as Achilles and Patroclus), she becomes jealous and angry, and dismisses them, unconcerned about the awful fate that awaits them. The Frau treats her sister like a slave, demeaning her lesbianism and casting her in films only as an Extra; on the up-side, though, the sister becomes expert at dying in myriad ways, which she amusingly demonstrates. The line between reality and delusion continuously blurs, as The Frau keeps insisting (as Riefenstahl did), that her only interest was Art, not politics, while the maw of Hell yawned outside her door. The play is tricky but fascinating, with its episodic, cinematic structure, its alternating narrators, its visual film effects, tender moments, callous cruelty and surprising comic relief. Getting the right tone is paramount. At Diversionary, there is primarily one note: shrill. McCue seems to scream nearly every one of her lines. There’s no discernible difference between her acting, directing and real-life personas, which renders her one-dimensional. As The Man, John DeCarlo also bellows his way through his scenes (both have done more nuanced work elsewhere). Jewels Weinberg injects a touch of sweet, gentle youth as The Boy. Tiffany Tang is both sensible and funny as The Extra. The design and technical elements support the production well. If only there were a little more gradation in the conception and execution. Performances are Thursday at 7 p.m., Friday-Saturday at 8 p.m.